These highlights do not include all the information needed to use EPINEPHRINE INJECTION, 0.3 mg and EPINEPHRINE INJECTION, 0.15 mg safely and effectively. See full prescribing information for EPINEPHRINE INJECTION, 0.3 mg and EPINEPHRINE INJECTION, 0.15 mg.
Epinephrine Injection, 0.3 mg and Epinephrine Injection, 0.15 mg are indicated in the emergency treatment of allergic reactions (Type I) including anaphylaxis to stinging insects (e.g., order Hymenoptera, which include bees, wasps, hornets, yellow jackets and fire ants) and biting insects (e.g., triatoma, mosquitoes), allergen immunotherapy, foods, drugs, diagnostic testing substances (e.g., radiocontrast media) and other allergens, as well as idiopathic anaphylaxis or exercise-induced anaphylaxis. Epinephrine Injection, 0.3 mg and Epinephrine Injection, 0.15 mg are intended for immediate administration in patients who are determined to be at increased risk for anaphylaxis, including individuals with a history of anaphylactic reactions. Epinephrine Injection, 0.3 mg and Epinephrine Injection, 0.15 mg are intended for immediate administration as emergency supportive therapy only and are not a substitute for immediate medical care. Selection of the appropriate dosage strength (epinephrine injection, 0.3 mg or epinephrine injection, 0.15 mg) is determined according to patient body weight. Inject epinephrine injection, 0.3 mg or epinephrine injection, 0.15 mg intramuscularly or subcutaneously into the anterolateral aspect of the thigh, through clothing if necessary. Instruct caregivers of young children who are prescribed an epinephrine injection, 0.3 mg or epinephrine injection, 0.15 mg and who may be uncooperative and kick or move during an injection to hold the leg firmly in place and limit movement prior to and during an injection [see Warnings and Precautions (5.2)]. Each epinephrine injection, 0.3 mg or epinephrine injection, 0.15 mg contains a single dose of epinephrine for single-use injection. Since the doses of epinephrine delivered from epinephrine injection, 0.3 mg or epinephrine injection, 0.15 mg are fixed, consider using other forms of injectable epinephrine if doses lower than 0.15 mg are deemed necessary. The prescriber should carefully assess each patient to determine the most appropriate dose of epinephrine, recognizing the life-threatening nature of the reactions for which this drug is indicated. With severe persistent anaphylaxis, repeat injections with an additional epinephrine injection, 0.3 mg or epinephrine injection, 0.15 mg may be necessary. More than two sequential doses of epinephrine should only be administered under direct medical supervision [see Warnings and Precautions (5.1)]. The epinephrine solution in the clear window of the epinephrine (auto-injector) should be inspected visually for particulate matter and discoloration. Epinephrine is light sensitive and the (auto-injector) is manufactured from transparent UV stabilized polycarbonate [see How Supplied/Storage and Handling (16.2)]. Epinephrine injection, 0.3 mg and epinephrine injection, 0.15 mg are intended for immediate administration as emergency supportive therapy and are not intended as a substitute for immediate medical care. In conjunction with the administration of epinephrine, the patient should seek immediate medical or hospital care. More than two sequential doses of epinephrine should only be administered under direct medical supervision [see Indications and Usage (1), Dosage and Administration (2) and Patient Counseling Information (17)]. Epinephrine injection, 0.3 mg and epinephrine injection, 0.15 mg should only be injected into the anterolateral aspect of the thigh [see Dosage and Administration (2) and Patient Counseling Information (17)]. Hold leg firmly during injection. Lacerations, bent needles, and embedded needles have been reported when epinephrine injection, 0.3 mg and epinephrine injection, 0.15 mg have been injected into the thigh of young children who are uncooperative and kick or move during an injection. To minimize the risk of injection related injury when administering epinephrine injection to young children, instruct caregivers to hold the child’s leg firmly in place and limit movement prior to and during injection. Rare cases of serious skin and soft tissue infections, including necrotizing fasciitis and myonecrosis caused by Clostridia (gas gangrene), have been reported at the injection site following epinephrine injection for anaphylaxis. Clostridium spores can be present on the skin and introduced into the deep tissue with subcutaneous or intramuscular injection. While cleansing with alcohol may reduce presence of bacteria on the skin, alcohol cleansing does not kill Clostridium spores. To decrease the risk of Clostridium infection, do not inject epinephrine injection into the buttock [see Warnings and Precautions (5.2)]. Advise patients to seek medical care if they develop signs or symptoms of infection, such as persistent redness, warmth, swelling, or tenderness, at the epinephrine injection site. Some patients may be at greater risk for developing adverse reactions after epinephrine administration. Despite these concerns, it should be recognized that the presence of these conditions is not a contraindication to epinephrine administration in an acute, life-threatening situation. Therefore, patients with these conditions, and/or any other person who might be in a position to administer epinephrine injection, 0.3 mg or epinephrine injection, 0.15 mg to a patient experiencing anaphylaxis should be carefully instructed in regard to the circumstances under which epinephrine should be used. Common adverse reactions to systemically administered epinephrine include anxiety; apprehensiveness; restlessness; tremor; weakness; dizziness; sweating; palpitations; pallor; nausea and vomiting; headache; and/or respiratory difficulties. These symptoms occur in some persons receiving therapeutic doses of epinephrine, but are more likely to occur in patients with hypertension or hyperthyroidism [see Warnings and Precautions(5.5)]. Lacerations, bent needles, and embedded needles have been reported when epinephrine injection has been injected into the thigh of young children who are uncooperative and kick or move during the injection [see Warnings and Precautions (5.2)]. Rare cases of serious skin and soft tissue infections, including necrotizing fasciitis and myonecrosis caused by Clostridia (gas gangrene), have been reported following epinephrine injection, including epinephrine injection 0.3 mg, in the thigh [see Warnings and Precautions (5.3)]. Epinephrine injection, 0.3 mg or epinephrine injection, 0.15 mg may be administered to pediatric patients at a dosage appropriate to body weight [see Dosage and Administration (2)]. Clinical experience with the use of epinephrine suggests that the adverse reactions seen in children are similar in nature and extent to those both expected and reported in adults. Since the doses of epinephrine delivered from epinephrine injection, 0.3 mg and epinephrine injection, 0.15 mg are fixed, consider using other forms of injectable epinephrine if doses lower than 0.15 mg are deemed necessary. Clinical studies for the treatment of anaphylaxis have not been performed in subjects aged 65 and over to determine whether they respond differently from younger subjects. However, other reported clinical experience with use of epinephrine for the treatment of anaphylaxis has identified that geriatric patients may be particularly sensitive to the effects of epinephrine. Therefore, epinephrine injection, 0.3 mg should be administered with caution in elderly individuals, who may be at greater risk for developing adverse reactions after epinephrine administration [see Warnings and Precautions (5.5), Overdosage (10)]. Epinephrine Injection USP, 0.3 mg and Epinephrine Injection USP, 0.15 mg are auto-injectors and combination products containing drug and device components. Each Epinephrine Injection USP, 0.3 mg (Auto-Injector) delivers a single dose of 0.3 mg epinephrine, USP from epinephrine injection USP 0.3 mg/0.3 mL in a sterile solution. Each Epinephrine Injection USP, 0.15 mg (Auto-Injector) delivers a single dose of 0.15 mg epinephrine, USP from epinephrine injection USP 0.15 mg/0.3 mL in a sterile solution. The Epinephrine Injection USP, 0.3 mg and Epinephrine Injection USP, 0.15 mg (Auto-Injectors) each contain 1 mL epinephrine, USP solution. Approximately 0.7 mL remains in the auto-injector after activation, but is not available for future use, and should be discarded. Each 0.3 mL in the Epinephrine Injection USP, 0.3 mg (Auto-Injector) contains 0.3 mg epinephrine, USP, 1.8 mg sodium chloride, 0.4 mg sodium metabisulfite, 0.4 mg sodium tartrate (dihydrate), hydrochloric acid to adjust pH, and water for injection. The pH range is 2.2 to 5.0. Each 0.3 mL in the Epinephrine Injection USP, 0.15 mg (Auto-Injector) contains 0.15 mg epinephrine, USP, 1.8 mg sodium chloride, 0.4 mg sodium metabisulfite, 0.2 mg sodium tartrate (dihydrate), hydrochloric acid to adjust pH, and water for injection. The pH range is 2.2 to 5.0. Epinephrine, USP solution deteriorates rapidly on exposure to air or light, turning pink from oxidation to adrenochrome and brown from the formation of melanin. Replace Epinephrine Injection USP, 0.3 mg and Epinephrine Injection USP, 0.15 mg if the epinephrine, USP solution appears discolored (pinkish or darker than slightly yellow) or if it contains a precipitate. Thoroughly review the patient instructions and operation of Epinephrine Injection USP, 0.3 mg or Epinephrine Injection USP, 0.15 mg with patients and caregivers prior to use [see Patient Counseling Information (17)]. Epinephrine Injection USP, 0.3 mg (Auto-Injectors) (epinephrine injections USP, 0.3 mg/0.3 mL) are available as Epinephrine Injection USP, 0.3 mg 2-Pack, NDC 0093-5986-27, a pack that contains two Epinephrine Injection USP, 0.3 mg (Auto-Injectors) (epinephrine injections USP, 0.3 mg/0.3 mL) and one Epinephrine Injection (Auto-Injector) trainer device. Epinephrine Injection USP, 0.15 mg (Auto-Injectors) (epinephrine injections USP, 0.15 mg/0.3 mL) are available as Epinephrine Injection USP, 0.15 mg 2-Pack, NDC 0093-5985-27, a pack that contains two Epinephrine Injection USP, 0.15 mg (Auto-Injectors) (epinephrine injections USP, 0.15 mg/0.3 mL) and one Epinephrine Injection (Auto-Injector) trainer device. Epinephrine Injection USP, 0.3 mg 2-Pack and Epinephrine Injection USP, 0.15 mg 2-Pack also include a W-clip to clip two auto-injectors together. Epinephrine, USP is light sensitive and the auto-injector is manufactured from transparent UV stabilized polycarbonate to protect it from light. Store at 20° to 25°C (68° to 77°F); excursions permitted to 15° to 30°C (59° to 86°F) [See USP Controlled Room Temperature]. Before using, check to make sure the solution in the auto-injector is clear and colorless. Replace the auto-injector if the solution is discolored (pinkish or darker than slightly yellow) or if it contains a precipitate. A healthcare provider should review the patient instructions and operation of epinephrine injection, 0.3 mg and epinephrine injection, 0.15 mg in detail, with the patient or caregiver. Instruct patients and/or caregivers in the appropriate use of epinephrine injection, 0.3 mg and epinephrine injection, 0.15 mg. Epinephrine injection, 0.3 mg and epinephrine injection, 0.15 mg should be injected into the middle of the outer thigh (through clothing, if necessary). Each device is a single-use injection. Advise patients to seek immediate medical care in conjunction with administration of epinephrine injection, 0.3 mg and epinephrine injection, 0.15 mg. Instruct caregivers to hold the leg of young children firmly in place and limit movement prior to and during injection. Lacerations, bent needles, and embedded needles have been reported when epinephrine injection, 0.3 mg and epinephrine injection, 0.15 mg have been injected into the thigh of young children who are uncooperative and kick or move during an injection [see Warnings and Precautions (5.2)]. Complete patient information, including dosage, directions for proper administration and precautions can be found inside each epinephrine injection, 0.3 mg or epinephrine injection, 0.15 mg carton. 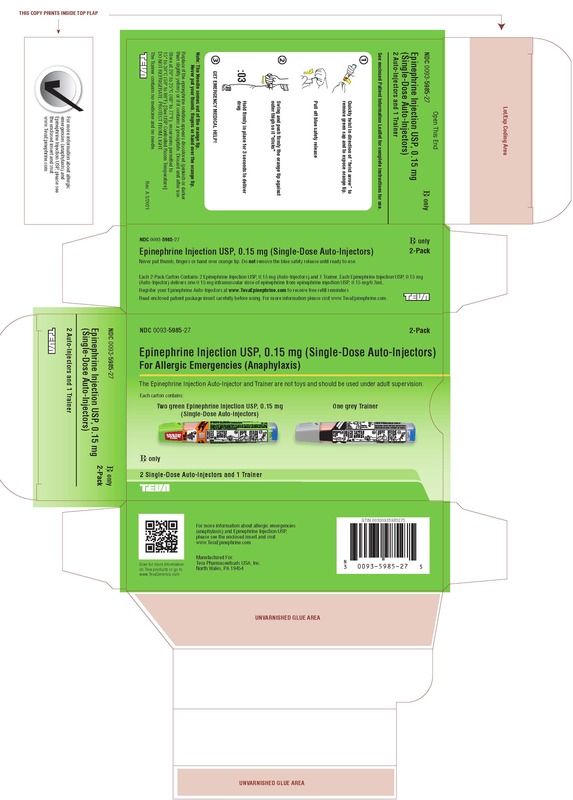 A printed label on the surface of epinephrine injection, 0.3 mg and epinephrine injection, 0.15 mg shows instructions for use and a diagram depicting the injection process. Instruct patients and/or caregivers to use and practice with the Trainer to familiarize themselves with the use of epinephrine injection, 0.3 mg and epinephrine injection, 0.15 mg in an allergic emergency. The Trainer may be used multiple times. A Trainer device is provided in 2-Pack cartons. 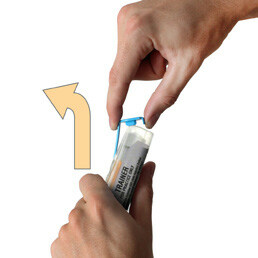 Instruct patients to inspect the epinephrine solution visually through the clear window of the auto-injector periodically. Replace epinephrine injection, 0.3 mg and epinephrine injection, 0.15 mg if the epinephrine solution appears discolored (pinkish or darker than slightly yellow) or if it contains a precipitate. Epinephrine is light sensitive and should be protected from light. The auto-injector is not waterproof. Instruct patients that epinephrine injection, 0.3 mg and epinephrine injection, 0.15 mg must be used or properly disposed once the blue safety release is removed or after use [see Storage and Handling (16.2)]. 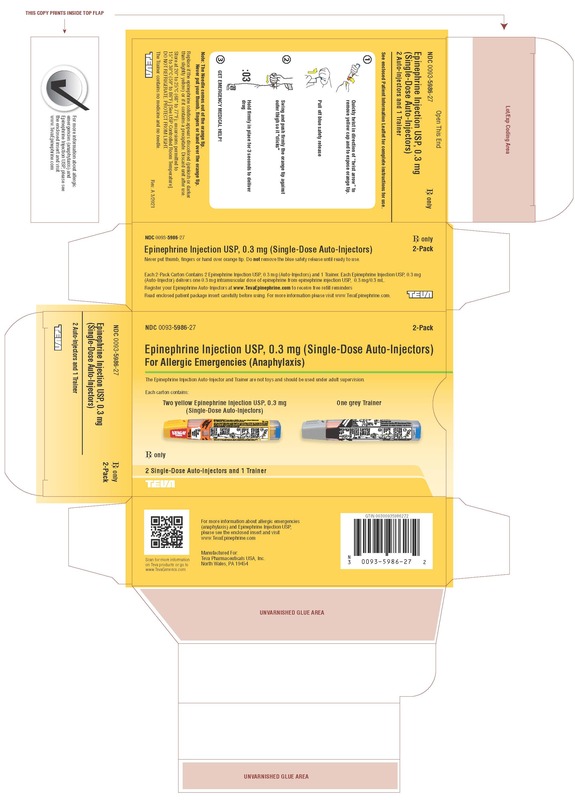 Complete patient information, including dosage, directions for proper administration and precautions can be found inside each epinephrine injection, 0.3 mg (Auto-Injector) and epinephrine injection, 0.15 mg (Auto-Injector) carton. Read this Patient Information Leaflet carefully before using the epinephrine injection, 0.3 mg (auto-injector) or epinephrine injection, 0.15 mg (auto-injector) and each time you get a refill. There may be new information. You, your parent, caregiver, or others who may be in a position to administer epinephrine injection, 0.3 mg (auto-injector) or epinephrine injection, 0.15 mg (auto-injector) should know how to use it before you have an allergic emergency. What is the most important information I should know about epinephrine injection, 0.3 mg and epinephrine injection, 0.15 mg? 1. Epinephrine injection, 0.3 mg and epinephrine injection, 0.15 mg contain a medicine used to treat allergic emergencies (anaphylaxis). Anaphylaxis can be life threatening, can happen within minutes, and can be caused by stinging and biting insects, allergy injections, foods, medicines, exercise, or unknown causes. 2. Always carry your epinephrine injection, 0.3 mg or epinephrine injection, 0.15 mg with you because you may not know when anaphylaxis may happen. Talk to your healthcare provider if you need additional units to keep at work, school, or other locations. Tell your family members, caregivers, and others where you keep your epinephrine injection, 0.3 mg or epinephrine injection, 0.15 mg and how to use it before you need it. You may be unable to speak in an allergic emergency. Use epinephrine injection, 0.3 mg or epinephrine injection, 0.15 mg right away. Get emergency medical help right away. You may need further medical attention. You may need to use a second epinephrine injection, 0.3 mg or epinephrine injection, 0.15 mg if symptoms continue or recur. Only a healthcare provider should give additional doses of epinephrine if you need more than 2 injections for a single anaphylaxis episode. What are epinephrine injection, 0.3 mg and epinephrine injection, 0.15 mg? Epinephrine injection, 0.3 mg and epinephrine injection, 0.15 mg are disposable, prefilled automatic injection devices (auto-injectors) used to treat life-threatening, allergic emergencies including anaphylaxis in people who are at risk for or have a history of serious allergic emergencies. Each device contains a single dose of epinephrine. Epinephrine injection, 0.3 mg and epinephrine injection, 0.15 mg are for immediate self (or caregiver) administration and do not take the place of emergency medical care. You should get emergency help right away after using epinephrine injection, 0.3 mg and epinephrine injection, 0.15 mg.
Epinephrine injection, 0.3 mg and epinephrine injection, 0.15 mg are for people who have been prescribed this medicine by their healthcare provider. The Epinephrine Injection, 0.3 mg (Auto-Injector) is for patients who weigh 66 pounds or more (30 kilograms or more). The Epinephrine Injection, 0.15 mg (Auto-Injector) is for patients who weigh about 33 to 66 pounds (15 to 30 kilograms). It is not known if epinephrine injection, 0.3 mg and epinephrine injection, 0.15 mg are safe and effective in children who weigh less than 33 pounds (15 kilograms). What should I tell my healthcare provider before using the epinephrine injection, 0.3 mg or epinephrine injection, 0.15 mg? Epinephrine injection, 0.3 mg or epinephrine injection, 0.15 mg and other medicines may affect each other, causing side effects. Epinephrine injection, 0.3 mg or epinephrine injection, 0.15 mg may affect the way other medicines work, and other medicines may affect how epinephrine injection, 0.3 mg or epinephrine injection, 0.15 mg work. Use your epinephrine injection, 0.3 mg or epinephrine injection, 0.15 mg for treatment of anaphylaxis as prescribed by your healthcare provider, regardless of your medical conditions or the medicines you take. How should I use epinephrine injection, 0.3 mg and epinephrine injection, 0.15 mg? Each epinephrine injection, 0.3 mg (auto-injector) or epinephrine injection, 0.15 mg (auto-injector) contains only 1 dose of medicine. Epinephrine injection, 0.3 mg or epinephrine injection, 0.15 mg should be injected into the middle of your outer thigh (upper leg). It can be injected through your clothing if needed. Read the Instructions for Use at the end of this Patient Information Leaflet about the right way to use epinephrine injection, 0.3 mg and epinephrine injection, 0.15 mg. Your healthcare provider will show you how to safely use the epinephrine injection, 0.3 mg (auto-injector) or epinephrine injection, 0.15 mg (auto-injector). Use your epinephrine injection, 0.3 mg or epinephrine injection, 0.15 mg exactly as your healthcare provider tells you to use it. You may need to use a second epinephrine injection, 0.3 mg or epinephrine injection, 0.15 mg if symptoms continue or recur. Only a healthcare provider should give additional doses of epinephrine if you need more than 2 injections for a single anaphylaxis episode. Your epinephrine injection, 0.3 mg (auto-injector) and epinephrine injection, 0.15 mg (auto-injector) may come packaged with an Epinephrine Injection Trainer and separate Epinephrine Injection Trainer Instructions for Use. The Epinephrine Injection Trainer has a grey color. The grey Epinephrine Injection Trainer contains no medicine and no needle. Periodically practice with your Epinephrine Injection Trainer before an allergic emergency happens to make sure you are able to safely use the real epinephrine injection, 0.3 mg (auto-injector) and epinephrine injection, 0.15 mg (auto-injector) in an emergency. Always carry your real epinephrine injection, 0.3 mg (auto-injector) or epinephrine injection 0.15 mg (auto-injector) with you in case of an allergic emergency. Additional training resources are available at www.TevaEpinephrine.com. Do not drop the auto-injector. If the auto-injector is dropped, check for damage and leakage. 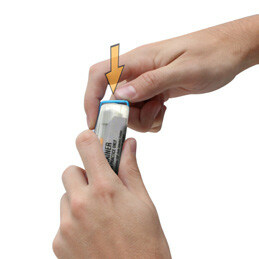 Dispose of the auto-injector and replace if damage or leakage is noticed or suspected. What are the possible side effects of epinephrine injection, 0.3 mg and epinephrine injection, 0.15 mg? Epinephrine injection, 0.3 mg and epinephrine injection, 0.15 mg may cause serious side effects. If you accidentally inject epinephrine injection, 0.3 mg or epinephrine injection, 0.15 mg into any other part of your body, go to the nearest emergency room right away. Tell the healthcare provider where on your body you received the accidental injection. Cuts on the skin, bent needles, and needles that remain in the skin after the injection, have happened in young children who do not cooperate and kick or move during an injection. If you inject a young child with epinephrine injection, 0.3 mg or epinephrine injection, 0.15 mg, hold their leg firmly in place before and during the injection to prevent injuries. Ask your healthcare provider to show you how to properly hold the leg of a young child during injection. If you have certain medical conditions, or take certain medicines, your condition may get worse or you may have longer lasting side effects when you use your epinephrine injection, 0.3 mg or epinephrine injection, 0.15 mg. Talk to your healthcare provider about all your medical conditions. These are not all the possible side effects of the epinephrine injection, 0.3 mg or epinephrine injection, 0.15 mg. For more information, ask your healthcare provider or pharmacist. How should I store epinephrine injection, 0.3 mg and epinephrine injection, 0.15 mg? Store epinephrine injection, 0.3 mg and epinephrine injection, 0.15 mg at room temperature between 68° to 77°F (20° to 25°C). Examine the contents in the clear window of your auto-injector periodically. The solution should be clear. If the solution is discolored (pinkish or darker than slightly yellow) or if it contains a precipitate, replace the unit. Always protect your epinephrine injection, 0.3 mg (auto-injector) and epinephrine injection, 0.15 mg (auto-injector) from damage and water. The blue safety release helps to prevent accidental injection. Keep the blue safety release on until you need to use epinephrine injection, 0.3 mg or epinephrine injection, 0.15 mg. Your epinephrine injection, 0.3 mg or epinephrine injection, 0.15 mg has an expiration date. Replace it before the expiration date. Keep epinephrine injection, 0.3 mg and epinephrine injection, 0.15 mg and all medicines out of the reach of children. Medicines are sometimes prescribed for purposes other than those listed in a Patient Information Leaflet. Do not use the epinephrine injection, 0.3 mg or epinephrine injection, 0.15 mg for a condition for which it was not prescribed. Do not give your epinephrine injection, 0.3 mg or epinephrine injection, 0.15 mg to other people. This Patient Information Leaflet summarizes the most important information about epinephrine injection, 0.3 mg and epinephrine injection, 0.15 mg. If you would like more information, talk to your healthcare provider. You can ask your pharmacist or healthcare provider for information about epinephrine injection, 0.3 mg and epinephrine injection, 0.15 mg that is written for health professionals. 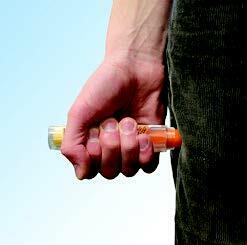 For more information and video instructions on the use of epinephrine injection, 0.3 mg and epinephrine injection, 0.15 mg go to www.TevaEpinephrine.com or call 1-888-838-2872. What are the ingredients in epinephrine injection, 0.3 mg and epinephrine injection, 0.15 mg? Inactive Ingredients: sodium chloride, sodium metabisulfite, sodium tartrate (dihydrate), hydrochloric acid, and water. 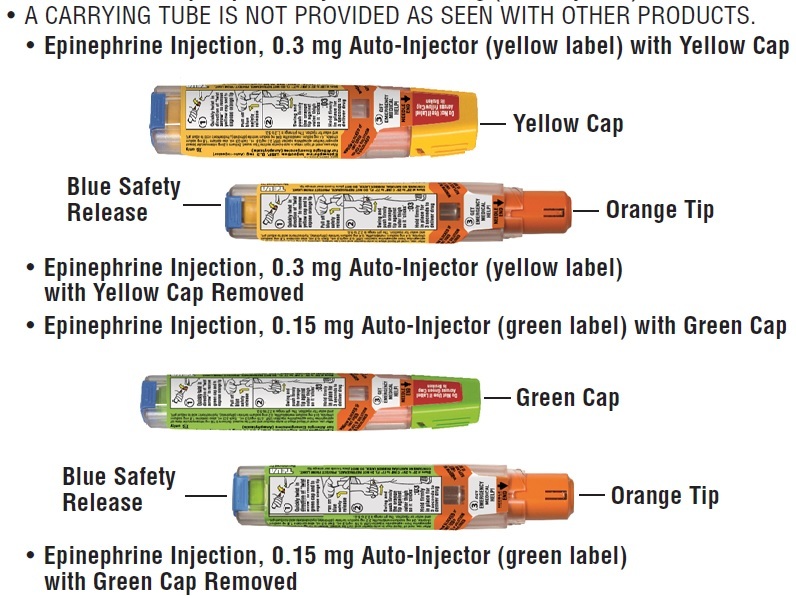 The Epinephrine Injection, 0.3 mg (Auto-Injector) has a yellow colored label. The Epinephrine Injection, 0.15 mg (Auto-Injector) has a green colored label. 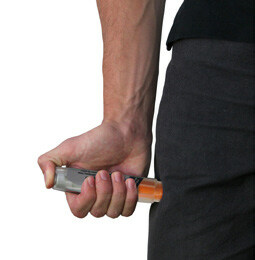 The Epinephrine Injection Trainer has a grey color and contains no medicine and no needle. The blue safety release on the Epinephrine Injection, 0.3 mg (Auto-Injector) and Epinephrine Injection, 0.15 mg (Auto-Injector) helps to prevent accidental injection of the device. Do not remove the blue safety release until you are ready to use it. Read these Instructions for Use carefully before you use epinephrine injection, 0.3 mg or epinephrine injection, 0.15 mg. Before you need to use your epinephrine injection, 0.3 mg or epinephrine injection, 0.15 mg, make sure your healthcare provider shows you the right way to use it. Parents, caregivers, and others who may be in a position to administer epinephrine injection, 0.3 mg (auto-injector) or epinephrine injection, 0.15 mg (auto-injector) should also understand how to use it as well. If you have any questions, ask your healthcare provider. Quickly twist the yellow cap off the epinephrine injection, 0.3 mg auto-injector or the green cap off the epinephrine injection, 0.15 mg auto-injector in the direction of the “twist arrow” to remove it. 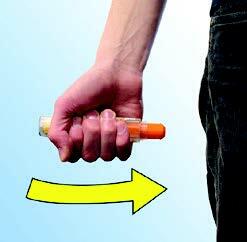 Grasp the auto-injector in your fist with the orange tip (needle end) pointing downward. With your other hand, pull off the blue safety release. If you are administering epinephrine injection, 0.3 mg or epinephrine injection, 0.15 mg to a young child, hold the leg firmly in place while administering an injection. Swing and push the auto-injector firmlyuntil it ‘clicks’. The click signals that the injection has started. The injection is now complete. Remove the auto-injector from the thigh.The orange tip will extend to cover the needle. If the needle is still visible, do not attempt to reuse it. Step 3. Get emergency medical help now. You may need further medical attention. You may need to use a second epinephrine injection, 0.3 mg auto-injector or epinephrine injection, 0.15 mg auto-injector if symptoms continue or recur. Give your used epinephrine injection, 0.3 mg auto-injector or epinephrine injection, 0.15 mg auto-injector to the healthcare provider for inspection and proper disposal. A carrying tube is not provided as seen with other products. Epinephrine injection, 0.3 mg and epinephrine injection, 0.15 mg are single-use injectable devices that deliver a fixed dose of epinephrine. The auto-injector cannot be reused. Do not attempt to reuse epinephrine injection after the device has been activated. It is normal for most of the medicine to remain in the auto-injector after the dose is injected. The correct dose has been administered if the orange needle tip is extended and the window is blocked. Your epinephrine injection, 0.3 mg auto-injector and epinephrine injection, 0.15 mg auto-injector may come packaged with an Epinephrine Injection Trainer and separate Epinephrine Injection Trainer Instructions for Use. The Epinephrine Injection Trainer has a grey color. The grey Epinephrine Injection Trainer contains no medicine and no needle. Practice with your Epinephrine Injection Trainer, but always carry your real epinephrine injection, 0.3 mg auto-injector or epinephrine injection, 0.15 mg auto-injector in case of an allergic emergency. If you are administering epinephrine injection, 0.3 mg or epinephrine injection, 0.15 mg to a young child, ask your healthcare provider to show you how to properly hold the leg in place while administering a dose. Do not try to take the epinephrine injection, 0.3 mg auto-injector or epinephrine injection, 0.15 mg auto-injector apart. Free Epinephrine Injection Auto-Injector Refill Reminder Program. It is important to keep your auto-injector up-to-date. Register up to 6 Epinephrine Injection 0.3 mg Auto-Injectors or Epinephrine Injection 0.15 mg Auto-Injectors and receive automatic Refill Reminder Alerts. For more information about Epinephrine Injection 0.3 mg Auto-Injector or Epinephrine Injection 0.15 mg Auto-Injector and proper use of the products, call Teva at 1-888-838-2872 or visit www.TevaEpinephrine.com. In an emergency: Do not use the grey Trainer. Use your real yellow Epinephrine Injection 0.3 mg Auto-Injector or green Epinephrine Injection 0.15 mg Auto-Injector. Periodically practice with the grey colored Trainer before an allergic emergency (anaphylaxis) happens to make sure you are able to safely use the real yellow epinephrine injection 0.3 mg auto-injector or green epinephrine injection 0.15 mg auto-injector in case of an emergency. Always carry your real yellow epinephrine injection 0.3 mg auto-injector or green epinephrine injection 0.15 mg auto-injector in case of an allergic emergency. • Never put your thumb, other fingers, or hand over the Orange Tip (below grey safety cap). 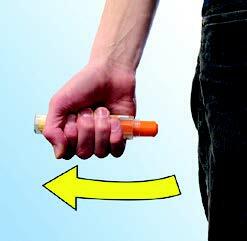 • The Orange Tip is where the needle comes out of your epinephrine injection 0.3 mg auto-injector or epinephrine injection 0.15 mg auto-injector. 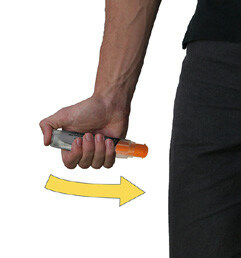 Grasp the grey Trainer in your fist with the orange tip pointing downwardand twist off Grey Cap in the direction of “twist arrow”. With your other hand,pull off blue safety release. If practicing with a young child, hold the leg firmly in place while using the Epinephrine Trainer. Ask your healthcare provider to show you how to properly hold the leg to practice so that you will be prepared before an allergic emergency happens. Swing and push the trainer firmlyuntil it ‘clicks’. The click signals that the injection has started. Remove the Trainer from the thighand massage the injection area for 10 seconds. The orange tip automatically extends out after use. NOTE: With the real yellow Epinephrine Injection 0.3 mg Auto-Injector or green Epinephrine Injection 0.15 mg Auto-Injector, the orange tip covers the needle after self-injection to help protect you from accidentally sticking yourself or others. In case of an allergic emergency, use the real yellow Epinephrine Injection 0.3 mg Auto-Injector or green Epinephrine Injection 0.15 mg Auto-Injector and not the grey Trainer. For more information about the Epinephrine Injection 0.3 mg Auto-Injector and Epinephrine Injection 0.15 mg Auto-Injector and the proper use of the products, go to www.TevaEpinephrine.com. Okay to remove and replace cap and/or safety release?